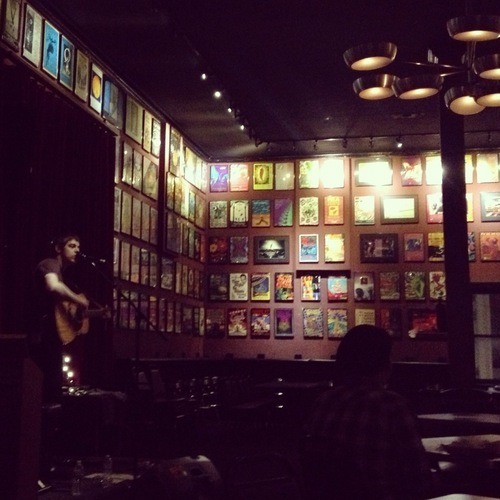 Two nights ago we played an acoustic set in The Poster Room of The Fillmore. It was a lot of fun, and the staff there was super nice and interesting. I spent a good portion of the night talking to a guy named Mark who was working one of the bars. He worked for Jerry Garcia for a long time, was a part of the green party, has a law degree, and is writing a novel. Sometimes the people working the venue seem ten times more interesting than the actual bands on stage. Ryan also met a guy working the downstairs back entrance who told him some crazy stories about previous shows. He said one night, a man entered the venue through one of the loading service elevators. He was completely trashed on some kind of barbiturate drug, and was so out of it, that he was slumped over against the wall and couldn’t stand correctly. Some friends tried helping him up, and called an ambulance to pick him up. As his friends escorted him out the back gate, he suddenly sprung to live, and started attacking people. The doorman said he started to claw at people “like a tiger”, and he had to be restrained by his friends. The ambulance took him off into the night.Two weeks passed by, and the doorman forgot all about the experience. The venue had just put up posters of some of the upcoming headliners who were going to be there shortly.One poster caught his eye, as a picture of a band set to appear looked familiar. Sure enough, the Tigerman was a member of one of the bands set to appear at the venue. Wikipedia had this to say about the term “running amok”. When I originally tagged this post, I jokingly tagged “The Tigerman Runneth Amok” and got curious about the meaning of the term, so I looked it up without realizing the origin of the term. I thought I’d come back and share it for the post since it clicked so well. Kind of spooky! Amok originated from the Malaysian word mengamuk, which roughly defined means “to make a furious and desperate charge”. According to Malay culture, amok was rooted in a deep spiritual belief. They believed that amok was caused by the hantu belian, which was an evil tiger spirit that entered one’s body and caused the heinous act. As a result of the belief, those in Malaysian culture tolerated amok and dealt with the after effects with no ill will towards the assailant. 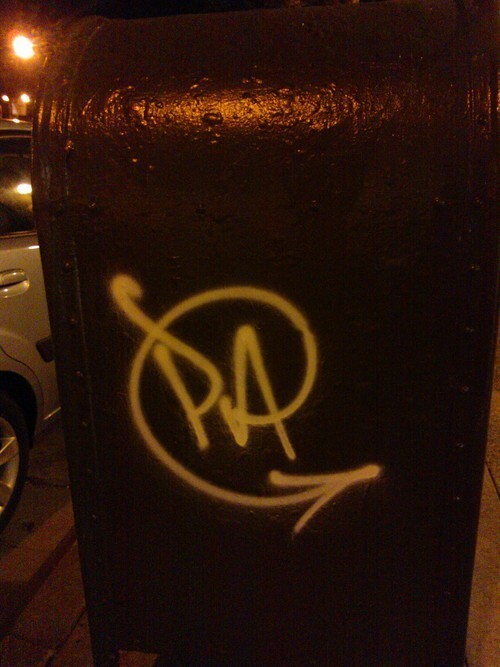 Brian and I found this cool graffiti tag on a mailbox as we went down the street to get our van. Thank you mystery tagger, for repping our band. Getting to play such a great venue, with such an immaculate history is really a huge blessing. We’re pretty honored, even just to play the little lounge area with some acoustic guitars. My mom shared a pretty cool thought with me, which was that when she was growing up, she dreamed of seeing rock shows at The Fillmore, and she wouldn’t have guessed in a million years, she would have a son who would play a gig there. This world is a crazy place. God willing we’ll get a chance to play the Poster Room again, and if so, we hope to see some of you there!